Allan Holtz, well-known in the comic strip fan community for his articles on comic strip history for magazines and books, and for his Stripper's Guide website, announces that his "Guide to U.S. Newspaper Comic Strips and Cartoon Panels" is now under contract to be published by University of Michigan Press. The book is a compendium of the vital statistics about comic strip and panel series that have appeared in American newspapers. A product of over twenty years of research, the books contains information on over 7,000 unique series from 1894 to present. For each feature the title and running dates are listed, along with dates for each artist, writer and syndicate involved. Alternate titles, format and frequency are detailed, along with a list of reprint books. Unlike previous reference works on the subject, Holtz's Guide takes into consideration the vast amount of misinformation that has been published about newspaper strip history. Therefore he does not include any feature that he hasn't seen himself. "One of the reasons I started working on this book many years ago was that I got frustrated with those references. There were so many mistakes in them. It seemed like every time I looked something up there was no agreement between sources, and many times my own collection, small as it was at the time, would prove the information wrong or incomplete. The worst was when they'd write about some feature and then I'd find out that no such feature had ever actually run in newspapers." Holtz's plan of attack, after first verifying that features did actually exist in newspapers, was to gather information from all the secondary sources he could find but then verify and correct the information based on primary sources. That meant twenty years of poring over newspapers on microfilm in addition to amassing a huge personal collection of newspaper comics. How much time did he spend in libraries? "There are librarians all across the country who recognize me on sight. My wife hasn't had a proper vacation in twenty years. Any time I have off from work becomes a trip to a library somewhere around the country with wife in tow as research assistant." Holtz calls the Guide a community effort at heart. "I'd like to make it clear that this work is not the product of one guy. I could never have done it alone. Not only have I built my work on pioneering researchers of the past, I've been lucky to discover a community of dedicated and knowledgeable comic strip fans who selflessly gave time and effort to tracking down information on my behalf." Every piece of data contributed to the listings is credited to the researcher responsible, and Holtz also credits the newspapers and reference works in which each nugget of information was discovered. The book includes not only mainstream features, but also local features and the products of the ethnic press. "I've done my best to leave no stone unturned, " says Holtz of the project. "I will never be able to call this reference absolutely complete. There are so many oddball newspapers out there, so many local and obscure features, that the well will never go dry.There are always new leads to track down and more papers to review." So why publish now? "Besides finding a publisher crazy enough to take it on? Many years ago a fellow collector was looking over what I had documented so far -- at the time it was only a 'mere' couple thousand features. He asked how many features in all it might be possible to document. Wanting to impress him I threw out a crazy number -- 7,000. He was suitably impressed and I'd just set myself a very high bar to hurdle. And yet, twenty years later, I hit that crazy number. It's time." 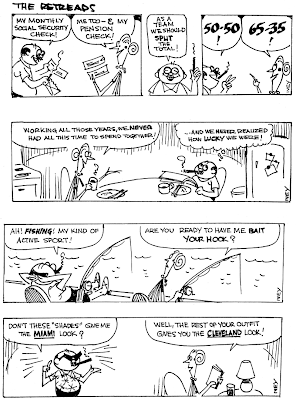 Allan Holtz writes about newspaper comics in Hogan's Alley magazine, the NBM "Forever Nuts" series of classic strip reprint books, and his popular blog, Stripper's Guide (http://strippersguide.blogspot.com). He is a resident of Tavares, Florida. The release date and price for the "Guide to U.S. Newspaper Comic Strips and Cartoon Panels" have not yet been set. The book is expected to be approximately 800 pages, and images of many of the features will be included on CDs or DVDs sleeved with the book. The title, which was long presumed to include Holtz's well-known "Stripper's Guide" moniker, has tentatively been neutered in deference to the sensitivities of library and school buyers. Jeffrey Lindenblatt. Without your expertise and untiring research on New York newspapers this day would have taken years longer to get here. Not to mention your friendship, cheerleading and constant support. You're the best! Nancy Goldstein. If you hadn't gone to bat for me with your publisher I have no doubt that my book proposal would still be sitting in slush piles. You are an outstanding scholar and an incredibly generous person. So now what? Since I live near Orlando, it ain't a trip to Disneyworld. No, I'm taking my wife for a proper vacation, nowhere near any library. We're leaving Monday and we'll be out of touch for two weeks. So, you ask, what the heck are youl going to do without a blog post to read every day? Fear not! I have prepared a special treat for you. For the next two weeks, Sundays excepted, we're going to have the Stripper's Guide Super-Quiz. Each weekday morning, assuming Blogger's auto-post function doesn't louse things up, you'll get five trivia questions about newspaper comics. They'll range in difficulty from medium tough right on up to mega-expert class, a selection from throughout the range each day. I've tried to pose questions that you can't just answer with a quick Google search. The answers to the week's questions will appear on Saturdays. There aren't any prizes other than bragging rights, so don't be shy. Shout out the answers by hitting the comment button on the posting. Be the first to post the right answer and feel smug all day long. There will be the thrill of victory, the agony of defeat, love won and lost, wars fought and peace made. Congratulations Allan! I hope this pays off for you in a big way! Warm congratulations for a long-time effort coming to fruition. My congratulations and my envy. I long for the day the book is released to get it immediately! Fantastic! Hope to see it soon (This year?). Will there be fair use images in the book itself or only on the cd/dvd? Excellent news! I'm glad you're going w/ a U Press, rather than one of the academic publishers whose prices are insane. I'll be awaiting the chance to buy my copy. Thang yew, thang yew to all. DD, the current plan is for the images to be on CD only. The cost of the book, which probably would have been 6+ volumes with printed images (at readable size), would have been astronomical and the production costs would have been through the roof. I'll warn you that even with this cost-saving measure it won't be a cheap book. But be assured that I'm working with the publisher looking for ways to keep the cost down to something the average Joe and DD can afford. Off on my vacation in mere hours now, see y'all in a couple weeks. Congratulations! This is a much-needed book and is destined to be as invaluable as your site! Congrats Allan! I am glad this will see print and its on my short list to buy! I'm already writing my letter to Santa. But I suppose it probably won't be available in time for this Christmas. Hey! Hey! Hey! Congratulations Allan! This is terrific, wunnerful news! I'm really looking forward to the book! I just can't wait to buy this book. It'll almost certainly change things, maybe even more than Bill Blackbeard's Smithsonian collection did. For years and years Buttons and Fatty was the marquee strip of the Brooklyn Eagle's children's section. When it made its bow on December 26 1909 it was just titled Buttons and it was a pretty nondescript feature about a sweet but inoffensively mischievous kid. In 1913 his buddy Fatty gained title billing as well. Al Zere, who did a lot of features for the Eagle over the years, was at the helm until March 24 1918 when he went off to serve in World War I. The Eagle made a pretty big deal over his going, giving the kids regular updates on his tour of duty with Uncle Sam. 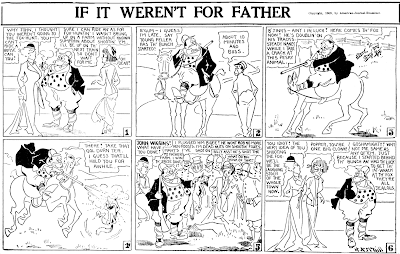 The strip was handed over to Hal Merritt who kept up the franchise until December 15 of that year. When Merritt left the strip went on hiatus until Zere returned from Europe to a hero's welcome. He started rewarming his chair at the Eagle and the strip was revived on July 13 1919. But Zere must have been restless because he left again, this time without any fanfare. His last Buttons and Fatty strip ran December 5 1920. A new cartoonist took over the following week, and Zere was quickly forgotten by the kids. M.E. Brady introduced long involved continuities into the strip (see the above for the tail-end of one) and the Eagle started having good luck syndicating the new more robust strip. Throughout the 20s and early 30s Buttons and Fatty was a popular adornment to the new Sunday kid sections that were becoming quite popular at papers around the country. Brady, who always signed himself "MEB", stuck with the strip for the rest of its life except for one short vacation in 1925 when fellow Eagle stalwart Phila Webb spelled him for a month (June 28 to July 26 1925). 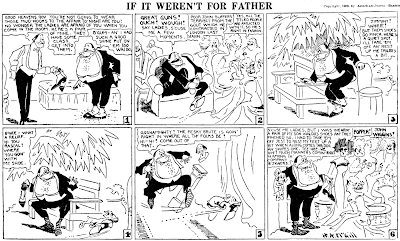 The downfall of the strip came when it was reformatted at the beginning of 1933. For over 20 years the strip had been a tabloid page, a perfect fit for the kid sections that had sprung up at papers all over the country. On January 8 1933, though, the Eagle changed it to a full newspaper page and the feature immediately disappeared from all those client newspapers. Perhaps the Eagle gave up on the syndication business temporarily, or maybe they were too dense to provide a tabloid format to their clients, but in any case they drove a stake through the heart of that strip. The strip continued until June 17 1934, but it was a dead man walkin' for that last year and a half. It's amazing how many strips I've never heard of that had a pretty respectable lifespan. I realize that 24 - 25 years is small change when it comes to syndicated strips, but in any other world that would be pretty darn good, breakout hit or not. News of Yore 1950: It's Howdy Doody Time! small and large fry see him five days a week); memorabilia; music; and regular trips to the Ringling Bros. Barnum & Bailey circus. But this week United Feature Syndicate announced plans to win him more friends. 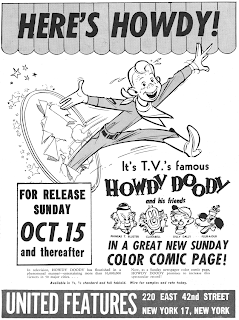 A "Howdy Doody" Sunday page will be ready for newspapers in early fall. Just to get the record straight on the "Howdy Doody" phenomenon, flourishing since 1947, we went to see Martin Stone of Martin Stone Associates. 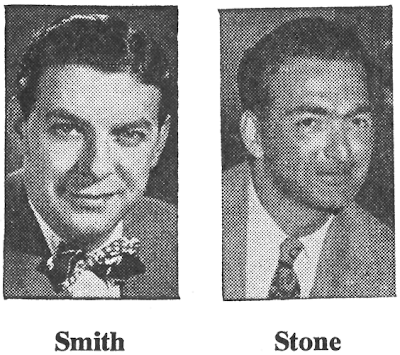 Mr. Stone, whose penthouse offices on 58th St. overlook Central Park, is co-owner with Bob Smith of the "Howdy Doody" TV show. He's co-producer (with Roger Muir of NBC) of the show and controls the licensing rights. "I think this is significant because it's the first time a character originated on television has gone into the comic strip field," said Mr. Stone looking toward the end of his office decorated with embattled books. Another show of Mr. Stone's is "Author Meets the Critics." The radio - video producer hastened to point out that he hadn't forgotten "Hopalong Cassidy," that other TV star. However, Hoppie was known in books, movies and radio long before he hit the home flickers. On the other hand, "HD," he said, is indubitably a TV baby. Mr. Stone said he'd been approached about a possible newspaper strip from time to time but he'd held off until he could develop one in his own office. The Sunday page, result of over a year's work, will carry the byline of "Chad" but will be the joint work of Chad Grothkopf, artist, and Milt Neil, writer. Both are members of Martin Stone Associates staff. As an added fillip, the Stone office expects to do a bang-up promotion job in newspaper towns. "Howdy Doody," puppet friends and Actor Bob Smith will be on hand for personal appearances at launchings of the strip. Would love to see what the finished results look like! Love the PM promo film Chad did! Added the promo ad. Enjoy! When I go on my research trips to various libraries around the country I'm always in a mad rush to get as much work done as possible in the short time I have. That means there's precious little time for reading the features I document for Stripper's Guide. That means I miss out on a lot of interesting discoveries like the one we have today in If It Weren't For Father. Sure, I documented it -- it ran in the New York Evening Journal from March 4 1909 to March 1 1910 and it was by Harold MacGill. But what I would have learned had I taken the time to read a few episodes is that this strip is quite obviously the inspiration behind one of the most popular strips of the 20th century. I won't tell you which one because it will become painfully obvious when you read the samples. 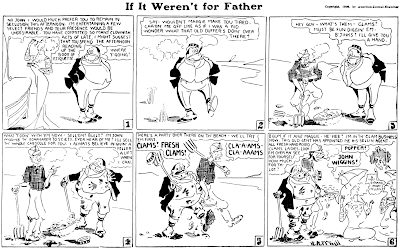 The very famous strip in question started just three years later, and whether you call it inspiration or a rip-off, you can bet the famous cartoonist in question was reading this strip since he was at the time working for Hearst's New York arch-rival, Joseph Pulitzer. Luckily we have Cole Johnson around who actually reads these darn things and made this amazing discovery. Thanks again Cole! It seems to me that you're onto something here, but ultimately both strips find their inspiration in William B. Gill's play "The Rising Generation," in which an Irish bricklayer from Harlem, played by Billy Barry, rises to the position of employer and then senator - all in spite of his greedy, lowdown "superiors." MacGill translated the idea to the comic page first, apparently. MacManus (who, if you think about it, had made a bit of a career out of parodies and knock-offs) took the idea and actually made it work. MacGill, though, clearly had a diamond in the rough here, and a nice little diamond it was. This strip ranks pretty high in the pantheon of weirdly titled features, and amazingly all the spelling stayed consistent on it from week to week. Consistency in titles and character names was a common shortcoming of these short-run strips back in the day. Cwaking Cwacks with Cwack was a delightfully dippy feature of the McClure preprint sections from May 28 to November 12 1911. The strip, when it was signed at all, bore the signature "Quack". My guess is that the strip is by Everrett Lowry. 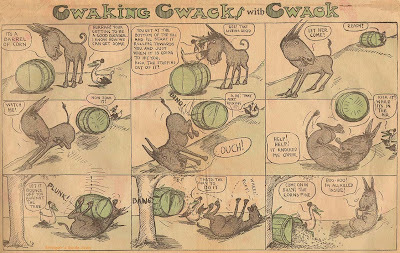 Among barnyard strips, which tended to be numbingly dull productions, Cwaking was a wonderful exception. Our educated duck and his/her dimwitted donkey pal really knew how to pull off good comedy, as can be seen above. "I'm all killed inside"! Nice little piece. The art isn't bad at all - it reminds me a little bit of what Warner Bros. animation would look like by the early 1940's. In addition, it's interesting to see the limited colour palette here. That's something that I don't see mentioned very often, if at all, about some Sunday funnies. Not everything was four colour back in the day. Good point Hugo. It should be noted that up through the teens the 'inside' pages of your typical Sunday comics section were at best three color jobs (black + 2 colors) or most often two colors like the above (black + in this case green). Some rinky-dink papers even ran the interior pages in one-color (and sometimes the one color wasn't black, a choice that makes for some really awful looking pages). In the 1920s full four color printing expanded inside of the big city sections, though even the majors would often scrimp on one or two broadsheet sides. Only in the thirties did full color throughout become typical, though even then there were plenty of exceptions. I was surprised to find a couple of "John Carter of Mars" Sundays printed in two colors in a major San Francisco paper...(the Chronicle? I don't have the paper at hand to confirm that)...red and black. ... and the Boston Globe, bastion of Yankee frugality, did some one-color pages into the 50s! Hello, Allan---I have some pre-printed 4-page sections up to December, 1946 that are black, white, and red only. These sections are from the the BELLINGHAM (Wash.) HERALD, and smply carry a generic masthead that says "COMIC SECTION", so it must have been offered (By KFS) to other small-town papers as well.-------------My two cents on CWAKING CWACKS..I just looked at quite a few of them, and I don't think Everett Lowry ever did the strip. "Quack" is the Otis F.Wood ghost artist, who cranked out a considerable amount of SAMBO, MAMA-LADE, BUB, POOR ROBINSON CRUSOE, and others. "CWAKING" might be the best thing this guy ever did, usually his work is pretty bad. Poor plotting, clumsy anatomy, ugly thick lines are the defining aspects of our friend "QUACK". ----Cole Johnson, snorting quack and going quackers in his quack house.